M3rNi3: KFC?! Nope, it's Popeye's! Hubby brought the angels and myself to the airport, T1 last Saturday and we ate at Popeye's. You ought to give it a try. 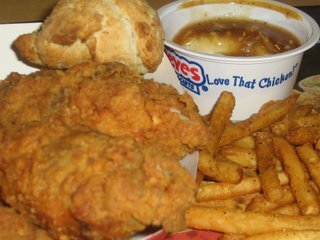 From the fried chicken to whipped potatoes to cajun fries and buttermilk biscuit .. they are soo yummylicious! 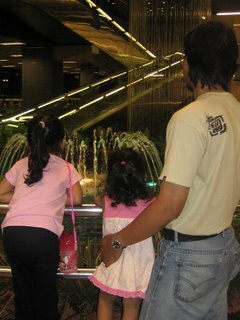 That's hubby and angels enjoying the water fountain. As I took this picture, I could clearly remember how when I was a child and whenever I visited the airport, I too enjoyed looking at the fountain as it changes its colours.